Here’s a hodge podge of me news from the last few months or so. First of all, I took a biology course at Austin Peay to make myself more marketable to graduate schools. It was an introductory course, but an intense one. It took place over three weeks and covered topics such as respiration, photosynthesis, mitosis, genetics and evolution. From the courses I took at Vanderbilt I had actually learned quite a lot of the information covered in the class, but the class put it all together in a neater arrangement, and there were a few things I hadn’t run into before that I was able to learn about. I did well in the course and got an A. I signed up for a human anatomy and physiology class in the Fall, because that course isn’t offered in the Spring and the other courses filled up or I needed prerequisites for them. I need to figure out what prerequisites I need and sign up for another class. I also probably need to start applying for graduate schools again and maybe sign up for the biology GRE. I didn’t show up last time for the BioGRE because two years ago I couldn’t find the will to wake up early in the morning. Now I’m a more responsible person and I have a better sleep schedule, so I should be able to do it. I’m still trying to look up some of the plants around my parents’ property without much luck. The professor of my biology class recommended I talk to somebody at Austin Peay, but I still haven’t made contact due to my not wanting to waste anybody’s time. 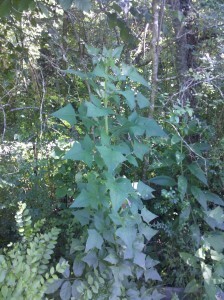 I found one plant that’s about 6 ft tall with hastate leaves in an alternate arrangement and with a circular stem about an inch in diameter. I’ve narrowed it down to family asteraceae and it looks like it might be in genus prenanthes, as it looks a lot like the pictures of the purple waldlattich in the prenanthes link, only that plant is supposed to only go to 150 cm and this one was as big as I am. Also, I haven’t seen any flowers on it yet. Every plant identification site seems to only care about the flowers. It’s a bit frustrating. On a musical note, I’ve started to practice playing the piano, which has been surprisingly entertaining. Right now I’m trying to play the Moonlight Sonata by Beethoven. I can almost get through the first two lines before madness sets in.